I really wanted to take some outside pictures today. Between DST and working 10hrs I was just to tired to get into the picture groove. I snapped a quick one in my favorite spot. The dining room. The lighting seems to be the best in my house and I like the french doors. We went to the cabin this weekend and it was nice to do some walking. My legs are feeling today and I'm enjoying the feeling. They have extended the bike path by our house so you can take it all the way to the new park. The park is beautiful. It has walking trails, a beautiful pond, play areas for little ones and even our four legged friends. The most incredible part is the stage and seating area. It was built on a dump site and all of the electricity is from methane gas. My promise to myself is to get up and go. Ride, walk I don't care I just need to move (and there is a cool bar to stop at on the way home!) Everybody has to pick their incentive! So have a good week and take a peek at a splash of tangerine. 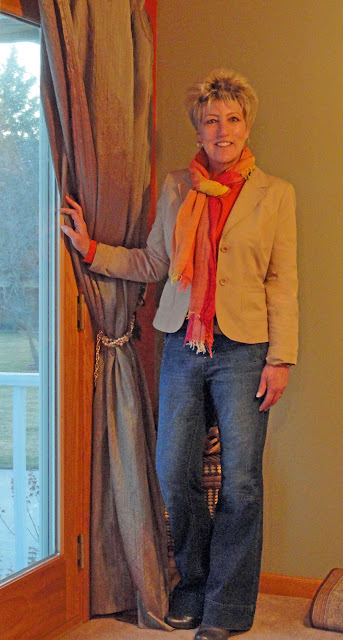 Linking up with Patti @ not Dead Yet Style for Inspiration Monday make a click and check out what is inspiring us this week. You look amazing in this outfit!! I love the way you did the scarf! This is such a great casual look...flattering, youthful, fun!! Good job! Tammy, whenever we take a bike ride we like to stop for a drink or an ice cream -- does that cancel out the exercise?? : > You look great and I love the way you styled your scarf. Thanks for linking up to Visible Monday, and I hope you have a great week. You look great in orange! How nice that you have biking/walking paths near your home. It makes getting out and moving around so much more pleasant. I love everything about this outfit. The colorful scarf is wonderful, the jacket is perfectly tailored, and those jeans are CRAZY-flattering! Wow! The way you have tied the scarf is wonderful. Now that the weather has changed--moving shouldn't be a problem. Love the outfit--hmm i have similar items in my wardrobe! !1 you've inspired me to try a new look next week!!! LOVE the tangerine on you, Tammi - plus I think these jeans have to be your perfect shape! They look seriously fabulous!!! I think the whole outfit is fabulous! I would've grabbed that zebra print blouse the instant I saw it!